Protests in Islamabad may force Xi to reschedule or curtail a planned mid-September trip to Pakistan. Chinese President Xi Jinping plans to make a tour of South Asia in mid-September, visiting India, Pakistan, and Sri Lanka. But with protests raging in Islamabad, some reports indicate that Xi may be considering postponing or even cancelling his visit to Pakistan. Such a move, it should be made clear, would be a last resort for Beijing. China values its partnership with Pakistan, one of China’s rare historic “all-weather” friends. Postponing Xi’s visit to Pakistan would be seriously damaging to the relationship, particularly if Xi sticks to his plan to visit India. Beijing has been exceptionally enthusiastic about working with new Indian Prime Minister Narendra Modi, a worrying sign for Pakistan. Meanwhile, despite a promising beginning under Modi, India-Pakistan relations have lapsed back into their old pattern of hostility. If Xi were to stop in New Delhi and not Islamabad, it would send a worrying signal to the Pakistani government that Beijing is more interested in India than Pakistan — and that is not a message Beijing is interested in conveying. However, the fact remains that Pakistan is hardly in a position to welcome China’s president. The protests in Islamabad are going strong after three weeks, with no end in sight. Two separate protests movements, led by Imran Khan and Tahir ul-Qadri, have converged on Islamabad, with both groups demanding that Prime Minister Nawaz Sharif be removed from office. The protests have grown both more chaotic and more violent as security forces adopt hardline tactics to protect government buildings in Islamabad’s “red zone.” With protests and clashes on the streets of the capital, the atmosphere is hardly conducive to a bilateral summit — not to mention the fact that, should the protestors have their way, Sharif’s government might be forced out of office in the near future. When asked about the potential of changing the schedule, Foreign Ministry spokesperson Qin Gang said that he had “no information to offer” about Xi’s visit to Pakistan. While Qin would neither confirm nor deny the reports, he emphasized the “very good relationship” between China and Pakistan and repeated China’s hope to see the conflict resolved “through consultation, dialogue and negotiation.” Qin also urged all relevant parties in the Pakistan crisis to “give priority to the fundamental interests of the state and the people,” a strong hint that Beijing wants the various political factions to resolve their differences so Islamabad can return to normalcy as soon as possible. According to Pakistani newspaper Dawn, Pakistan Foreign Office spokesperson Tasneem Aslam confirmed that Xi’s visit is not being cancelled or delayed. Aslam said that a high-level delegation from China is already in Islamabad to make the final preparations for the visit. Pakistan’s government certainly wants the visit to go as planned, despite the protests. China is too important of a partner, both politically and economically, for Pakistan to risk scuttling a top-level bilateral meeting due to domestic turmoil. Islamabad has high expectations for the summit. As Pakistan’s Express Tribune reported, Shahbaz Sharif, the chief minister of Punjab province (and the prime minister’s brother), expects a number of development deals to be signed during the visit. He made it clear that deeper economic cooperation with China is vital for Pakistan’s future. Sharif also praised Chinese companies for their investments in Pakistan, citing the deals as an example of China’s confidence in its neighbor. 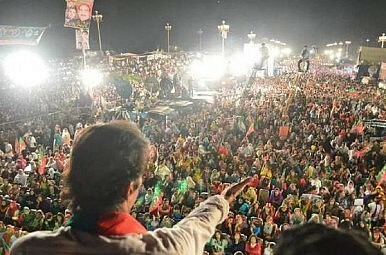 Now that confidence is threatened by the protests — Sharif blamed the protestors for preventing progress on several mass transit projects in Islamabad. Should the protests continue to rage on, it would add one more security headache for Beijing, which already worries about Islamabad’s ability (or willingness) to root out extremists that target China. Given the importance of Xi’s visit, Nawaz Sharif’s government will likely increase its efforts to quell the protests in advance of the trip. No specific dates have been given for Xi’s visit, but reports indicate it’s currently planned for September 14 to 16 — which leaves Sharif less than two weeks to create a more welcoming environment for Xi.